Everybody today thinks they are the next Iron Chef. With the popularity of the Food Network and the Cooking Channel every housewife secretly lusts over guys named Alton, Guy, and Robert Irvine, or Bobby Flay while they sit on the couch poppin’ Pizza Rolls. 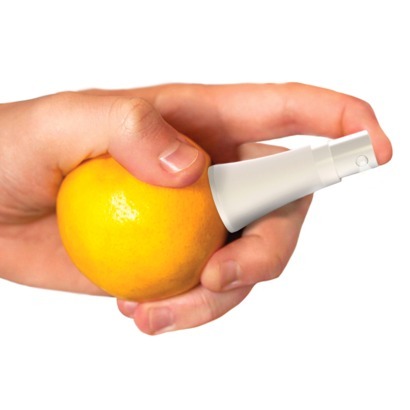 This innovative fruit juice spritzer from Quirky allows you to spread juice straight from fresh fruit evenly over your meal. Spritz citrus juice over your pancakes, add lemon to your scampi, or add a squirt of fresh juice to your favorite drinks with no mess or fuss. Simply push the hygienic plastic stem into your preferred fruit and squirt. The spritzer can be pulled apart for easy cleaning. Order yours today– but you’d better hurry Christmas is right around the corner. I bet you can’t wait to see the joy on their faces when they tear open the package and finding a Quirky Sten Juice Spritzer. Well look at it this way, it’s not a can of Simonize!